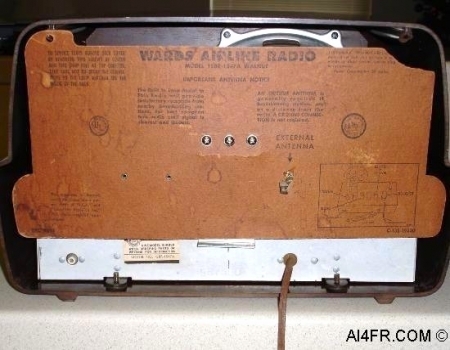 Manufactured by Montgomery Ward & Co., this model Airline 15BR-1547A is a 4 tube Super-Heterodyne receiver which uses an IF frequency of 455 kHz. The receiver frequency range is 540kc to 1600kc which makes it an AM broadcast band only receiver. 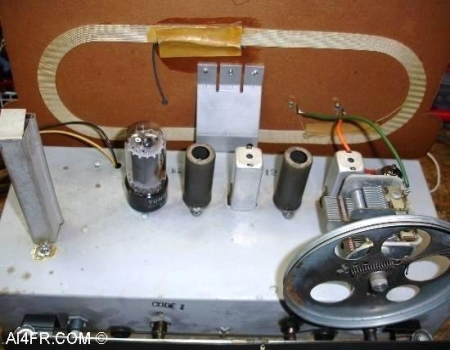 The tubes and their functions are as follows, a 50L6 as an Output Amplifier, a 12AT6 or 12AV6(can use either) as a Detector, AVC and Audio Amplifier, a 12BA6 as the IF Amplifier and a 12BE6 as the Converter. The power source is 115 volts and the receiver uses a PM speaker which has an impedance of 3.2 ohms. The power out is 1 watt undistorted and 2 watts maximum. The selectivity at 1000kc is 50kc and the sensitivity is 20 microvolts for .05 watts output. 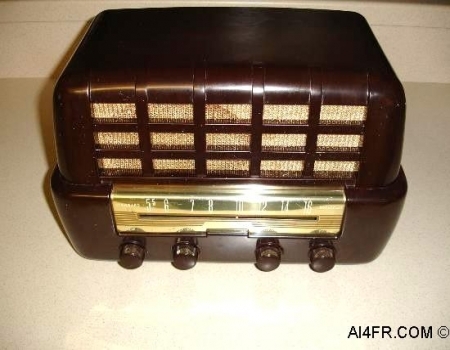 It is a rather large bakelite radio with four knobs. Starting at the left the control knobs are as follows, a Tone control, On/OFF and Volume control, a Tuning knob, and a Phono/AM control. 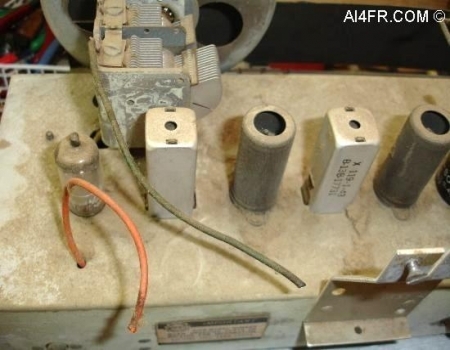 The phono/AM selector will allow the operator to plug in a RCA jack from a phonograph, and play it through the radio. The connector for this jack is located on the left rear of the back panel. This receiver has a built in loop antenna but it also has a connection on the rear for an external antenna. Both of the pictures above show the radio after it was restored. These next two photographs were taken during the restoration process. As can be seen, there are wires that have been cut and lots and lots of dust. While all this dust is not quite an inch thick, I do think it was trying to get there. 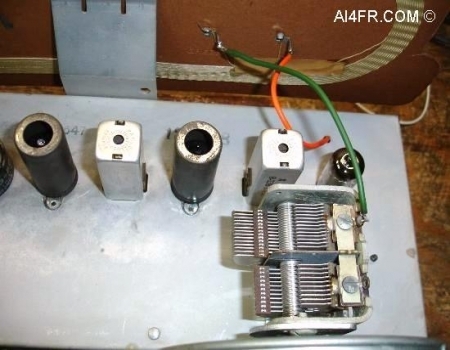 The photograph on the left is a picture that shows where some rats or mice had made a home in this radio at one time. 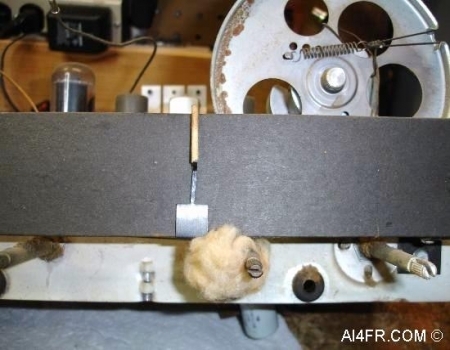 Their bedding material is wrapped around the tuning control and dial string. 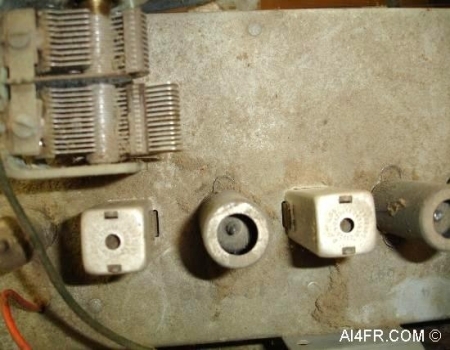 The photograph on the right is a picture that shows a typical cause of failure in many of the electronics of yesteryear. Notice the other half of the bumble bee capacitor laying on the chassis. This capacitor was actually replaced some time in the past and as can be seen it has failed again. The black on the cabinet in the picture is not a shadow but rather the result left by the magic smoke being let out. The bluish square item to the right of the capacitor is the Selenium Rectifier. The photograph on the left is a picture of under the chassis before restoration. Only one of the two large electrolytic capacitors is original. The light blue one is a cut and splice repair that only attempted to fixed half of the problem. The brown paper capacitor(original) has 4 sections in it while the blue one has only two. Or looking at it another way, think of it as only replacing the front brake pads on your car on just the drivers side. There is a very good chance that the other side will fail soon as well. The photograph on the right is a picture of under the chassis after the restoration was completed. This picture shows many of the newly installed parts. 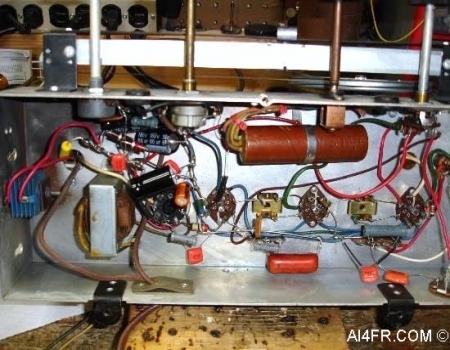 While this radio is one that is not found very often, it is still not rare or worth much but at the same time I wanted to leave the original large brown capacitor in place but not connected to the circuit. Not knowing what the future may bring for this radio, a future collector may be appreciative knowing that the original is there. Some times I drill out the old original capacitor and stuff the replacements inside. Capacitors that are made today are not only sturdier and more precise but also much smaller. A capacitor from yesteryear that was the size of a roll of quarters is now the size of a pencil eraser today. 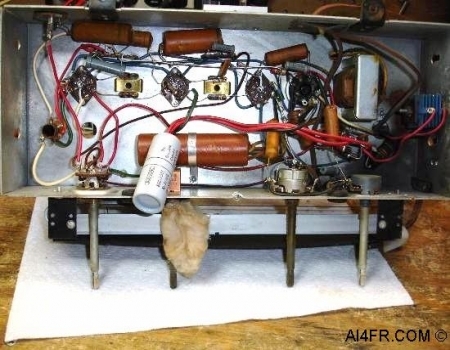 These last two photographs show the restoration of this radio just about complete. 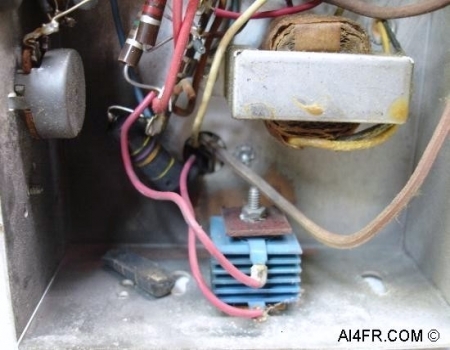 There is no more dust and the air variable capacitor has been cleaned and lubricated. After connecting one more wire this chassis will be ready for its cabinet at last albeit a few pounds lighter.